Pro Charging Systems OEM replacement battery charger i4815OBRMLIFTSPC for Genie Articulating Z Boom Z-34/22DC, Z-40/22DC, Z-45/25DC, and Z-45/34DC. 48 volt, 15 amp output for standard output battery charging. 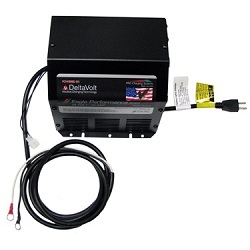 Specially designed to replace OEM Genie charger for industrial applications - safe, reliable, and efficient. Compatible with OEM Genie battery chargers for Genie Articulating Z Boom Z-34/22DC, Z-40/22DC, Z-45/25DC, and Z-45/34DC, Genie charger models 54794, 54795, 54796, and 54797.